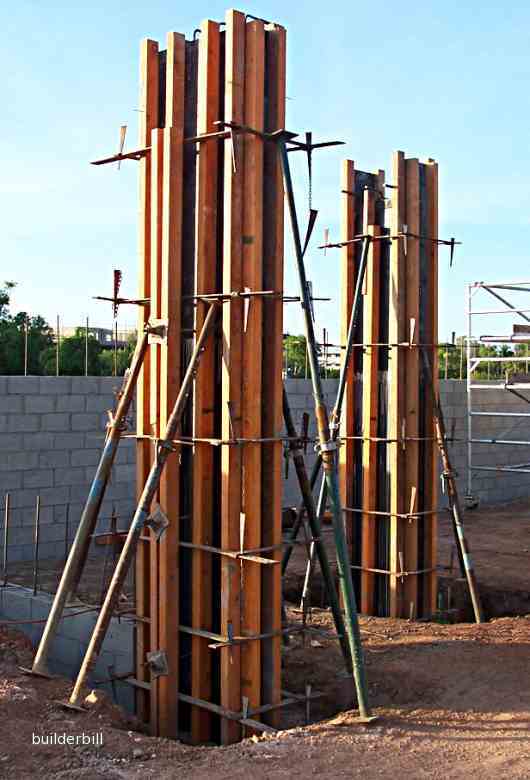 Timber, steel or other materials used to form concrete columns. Wet concrete, especially under vibration acts like a liquid. In simple term the pressure is greater as the concrete gets deeper. Using timber and formply these forms use metal column clamps to resist the forces hydrostatic pressure. Also this pressure works in all directions, which means for us, sideways and also upwards. It is possible for forms to lift. Note that the supports are closer together at the bottom of the forms. Note also that the column in the foreground is wider than the other one and to stop the possibility of the column clamps bending a row of through bolts has been added to the lower section of the form.